See where it all began on fictional Ramsay Street, tucked away in the suburbs of Melbourne. The TV families may have changed over the seasons, but the exteriors of the houses remain the same and you’ll get to capture it all, and meet one of the past or present cast members with this tour. 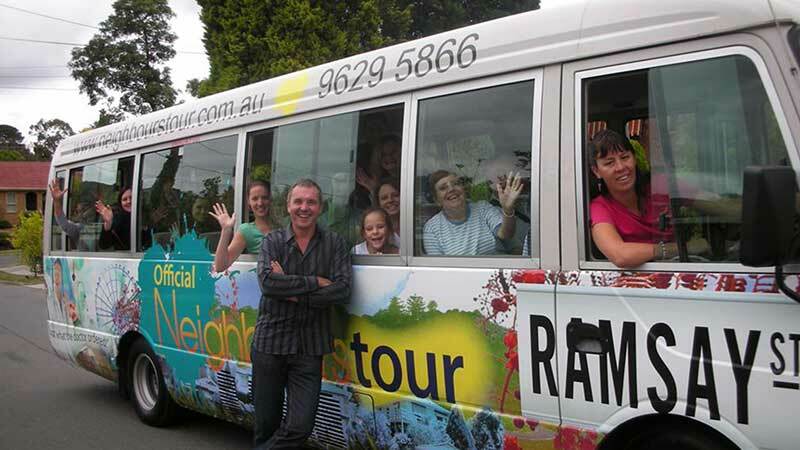 Step into the Neighbours world with this tour and have the opportunity to meet your favourite stars. You will visit the real Ramsey Street as well as the studios and other famous places in the show. You can take photos of the sets and have your Neighbours souvenir gift autographed by one of the stars. On board the guides will provide you with heaps of gossip, laughs and entertainment and you may even be lucky enough to see some filming. This is a must-do for the true Neighbours fan.